Last night was an interesting point. For the first time, EVER, I said I think it’s time to get rid of all the consoles. I’m a gamer, and I love my games. I refuse to give up my games. But…I am tired of having so much stuff, too. I love Steam for this reason. Most of the games I own are now on my PC. Some of them aren’t on Steam, but most of them are. That means I can just install them when I want to and go. But the consoles…I love consoles. I love some of the games I have that are only available on console. But the problem is they take up a lot of space. I have six of them, and two stacks of games, and a bunch of wiring, controllers, etc. etc. etc. Time to give them up. Time to clear out my home and start downsizing everything we have down to just the absolute essentials. I know a lot of the problems I’ve been having lately are due to the fact that the house is so cluttered. I come home and I look around, and I’m just not happy. It’s sad, and I hate it. I sometimes avoid it because I know I’ll have to clean the kitchen before I can use it. But if we only have the things we need, and nothing else, then maybe it wouldn’t be so bad. Sure, keep some of the keepsakes, and awesome things (like my master sword) but get rid of the rest of it. 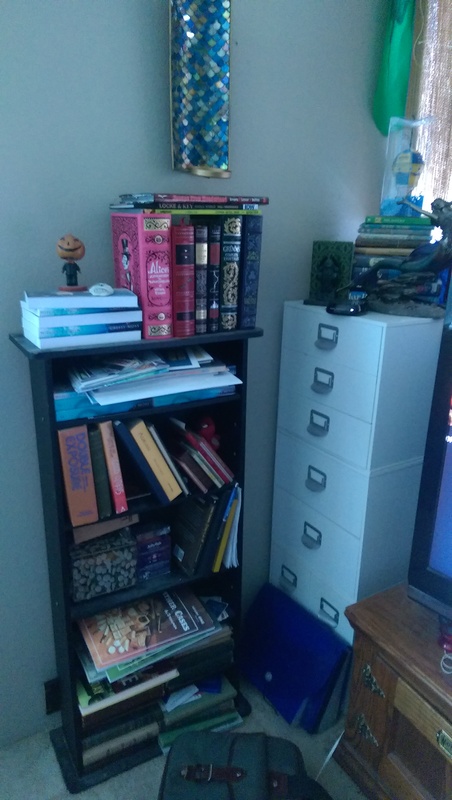 I have five book cases of books, many of which I haven’t read yet. I will never get around to reading them, there just isn’t enough time in the world. So maybe it’s time I start pairing down to only the books I absolutely love, and buy the rest I want to read on kindle. But that’s a discussion for another day. My five minutes are up.